A couple of weeks ago, Intel announced its first batch of 8th-generation CPUs. They’re improved versions of the current Kaby Lake chips, but with double the cores. This results is that Intel says these chips offer up to 44 percent better performance with a negligible impact on battery life. While these chips might not have the fancy new Intel 14nm++ architecture we were expecting, the new 8th-gen chips allow PC makers put quad-core chips in systems that previously capped out at two and that’s still damn cool. However, until this week’s IFA tech extravaganza in Berlin there were almost no computer makers that had actually announced products featuring these chips. Now there are a bunch officially coming down the pipeline. Here are the coolest Intel 8th-gen laptops announced so far. The jewel of Dell’s laptop lineup isn’t any different on the outside, but it has gotten an upgrade internally. Due out on September 12, the refreshed XPS 13 will be available with either Core i5 or Core i7 8th-gen chips. However, for people actually planning to buy one be careful when ordering, as Dell is still selling older XPS 13s with 7th-gen CPUs. If you want to make sure you are getting the latest silicon, check and see if the processor has an 8 in the product number following the class designation, e.g. Intel Core i7 8550U. Along with new 8th-gen Intel chips, Lenovo is revamping its flagship 2-in-1, the Yoga 920, with a sleeker design, far-field microphones for use with Cortana, and new stylus support that works with Windows Ink. And of course, you still get that gorgeous watchband hinge that sets Lenovo’s top-of-line convertible apart from every other 2-in-1 on the market. The one sad part about all this is that Lenovo is dropping its signature orange color option. However the company is hoping to make up for that loss with new optional Gorilla Glass lids when the Yoga 920 arrives sometime in October. Starting at $1,699 and due out sometime in December, Acer’s Switch 7 Black Edition is more than just a simple Surface clone. On top of new Intel 8th-gen CPUs, the Switch 7 Black is the world’s first fanless detachable with discrete graphics. And while the Switch 7’s Nvidia MX150 GPU isn’t going to be enough to run AAA games at 60 fps on its 13.5-inch 2,256 x 1,504 display, it should be a big help to anyone trying to edit some photos or videos on the go. Unlike the Surface Pro, the Switch 7 Black’s detachable keyboard is included for free. Asus’ Zenbook 3 Deluxe was already a great, and more affordable, alternative for people who prefer thin PCs. But now that Asus has refreshed it with new 8th-gen chips, it’s even more powerful. 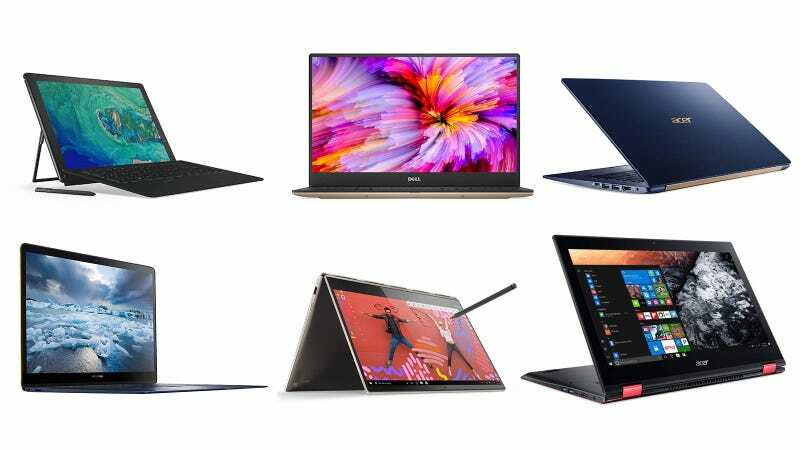 Available sometime this fall, you still get the same 14-inch screen with super slim bezels and the ability to configure it with up to 16GB of RAM and a 1TB SSD. Weighing in at just 2.1 pounds, Acer claims its new Swift 5 is the lightest 14-inch laptop in the world. Starting at $999 and due out in December, it’s pretty cheap, but it doesn’t skimp on ports or specs thanks to a 1920 x 1080 IPS touchscreen, both types of USB-C and of course, Intel 8th-gen processors. It’s not super flashy, but if you care about treating your back and shoulders better, the Swift 5 is something you could consider. Is it a 2-in-1 or is it a casual gaming machine. Actually it’s kind of both, and while that puts it in the awkward position of being a jack-of-all-trades and master-of-none, the $999 Nitro Spin 5’s Nvidia 1050 GPU should be good enough to play most AAA titles at full HD, as long as you don’t mind turning the settings down a bit. The system is due out in October, but until then, the Nitro Spin 5 prompts another question: Where are all the real gaming PCs at? Initially, Intel’s 8th-gen processors consist only of Core i5 and Core i7 U-series chips, which are found in 2-in-1 and ultraportable laptops rather than the monster gamer ones. That’s why newly announced stuff like the 17-inch Razer Blade Pro and Asus ROG Strix Scar aren’t listed here. That means people looking for more affordable Core i3 CPUs found in super cheap machines, or the beefier HQ processors that you would normally find in mobile gaming machines, will have to wait until next year. The same goes for 8th-gen desktop processors too. And then we’ll say goodbye to Kaby Lake R, and the cycle starts all over again.